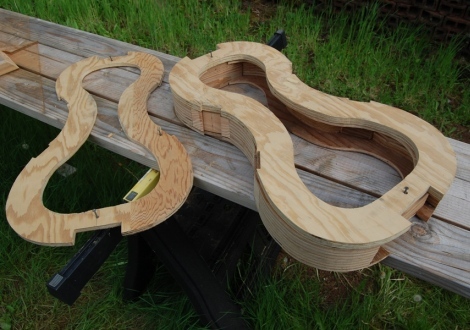 Building a Cello–Step #3: Building a collapsible mold with which to build a cello. The mold is a structure to hold the shape of the ribs until they are glued to the front and back plates, as well as to hold the blocks rigidly until the corpus is assembled. Since the plates actually derive their respective shapes from that of the mold and ribs, it is very important to get the mold as accurate as possible. In small molds (violin, viola, etc.) 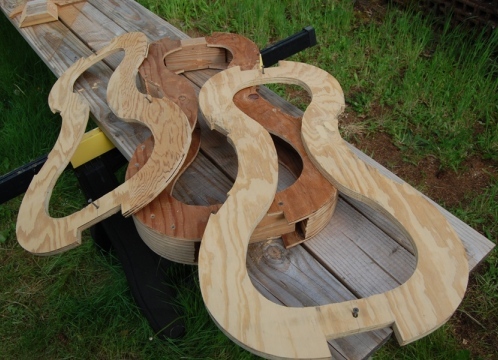 the end and corner blocks are simply glued into the mold, and the glue line is broken later, in order to remove the mold from the body of the violin or viola. (Remember that the blocks are a permanent part of the instrument– the mold is temporary. It has to be right, but it can be “cheaply right”, or “expensively right”. I went with “cheaply right”.) In larger instruments it is possible to secure the blocks using screws from the inside of the mold, so that it is not necessary to break glued joints in order to remove the mold. This mold is designed to come out in pieces, for easy removal. As you can see, above, the main body shape was simply built up with layers of plywood. I had a bunch of scrap plywood in my shop, so I traced out individual sections, from the mold template (from step #2), cut them all out, stacked them, and secured them with glue and drywall screws. So, essentially, the whole mold is in six pieces: left and right, top and bottom end blocks, and front and back sections. After they were all assembled, with extra room left around all edges, I checked one last time, using the mold template, and cut the mold out on a bandsaw, then smoothed the sides on an oscillating spindle sander (like a drum-sander). The sander keeps the edges at a right angle to the front and back. It is really a handy tool, which has paid for itself many times over. 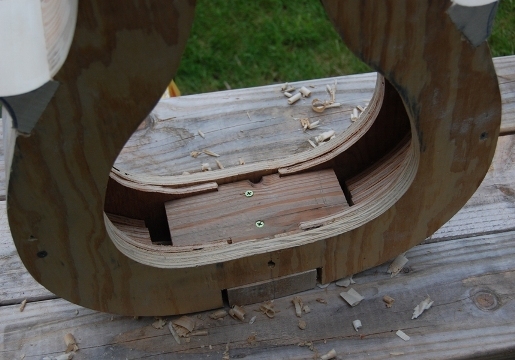 Here, the front of the cello mold is in place, but the back is still off. Above, you can see that the front and back sections of the mold are secured only with screws, so they can be easily removed, after the ribs are in place, so the linings can be installed. I used about eight screws each, front and back. Cello mold with end block screwed in place for easy removal. Here you can see how the deck screws pass through the end block of the mold, to secure the end block of the cello. You must be sure to use short enough screws that they will not protrude all the way through the block. You only want the screws to penetrate the blocks by 3/4″ or so, and right along the center line. If you ever run into one of those screws with a cutting tool, you will be shocked at the damage it will do to your expensive tool. Notice that in this photo, the blocks are already shaped. In reality, they are installed in rectangular form, and shaped afterward. See the next picture. This is how the block shapes are transferred from the mold template. This is how the mold template is used to trace the shape of all six blocks. You trace one half, then flip the template over to trace the other half. 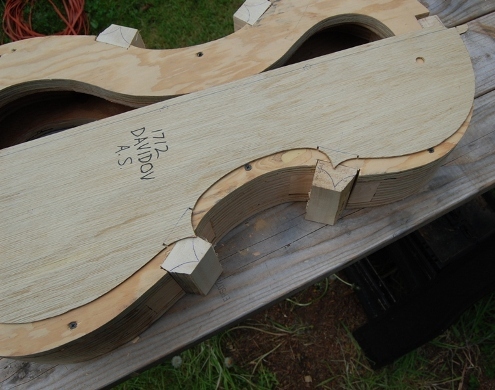 Be very careful to do this step accurately, as it will determine the final shape of the cello. I cut the inner curve of the center corner blocks close to the line with a bandsaw, then used the spindle sander again to get exactly to my line. I wait until after the C-bout ribs are installed to trim the outer part of the center blocks. I’ve never had a block fail, but I have been told that if you cut them too soon they can be fragile and flexible, and you may end up either bending or breaking them. Next we’ll talk about bending ribs.